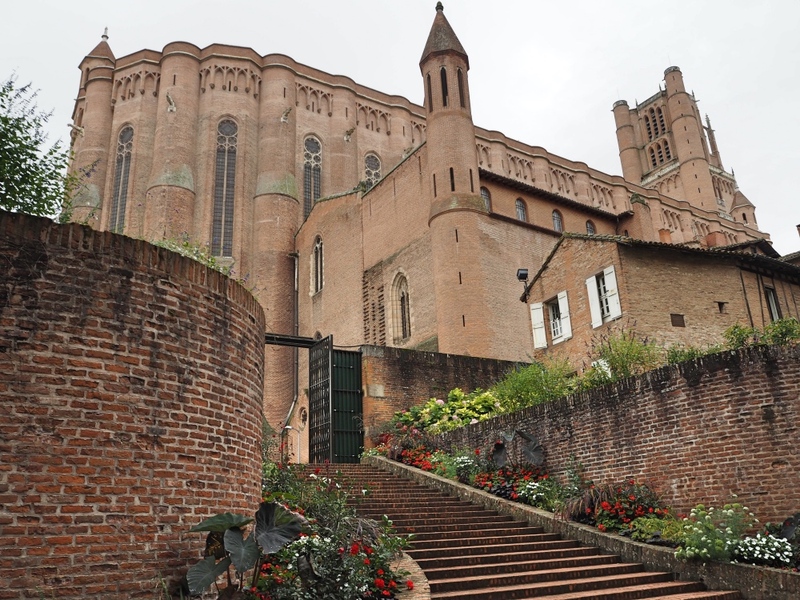 The day after visiting Toulouse, “The Pink City”, we made our way across to Albi, “The Red City”. 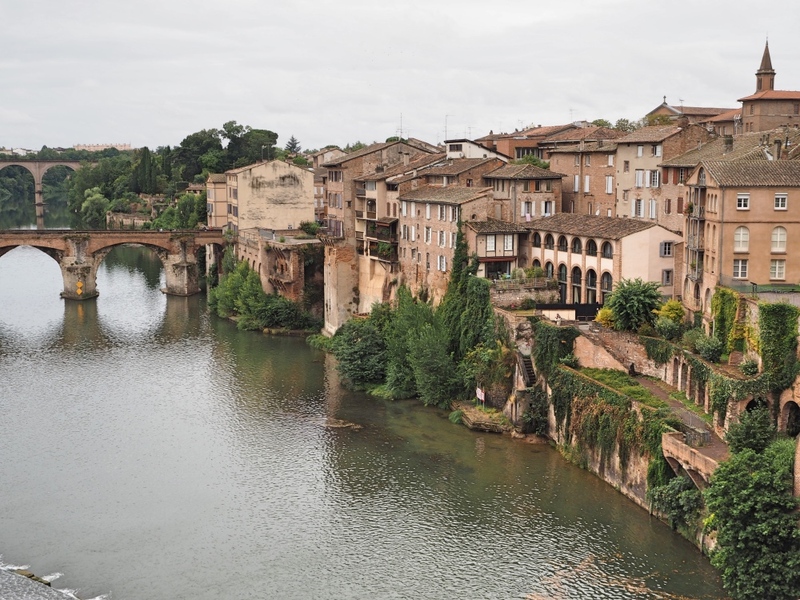 Albi is set on the banks of the Tarn river, about forty minutes drive from Toulouse. 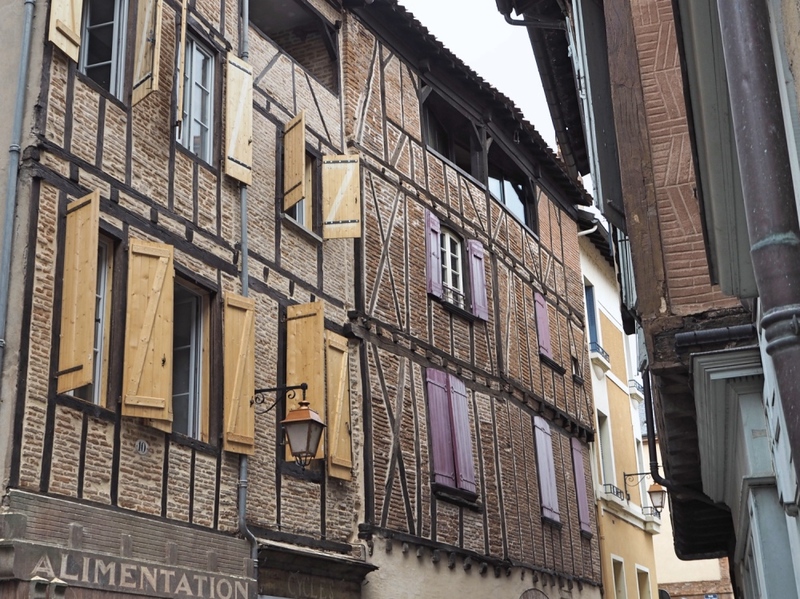 Its episcopal old town, located right in the middle of Albi became a UNESCO World Heritage site in 2010. The view over the Tarn river from the Berbie palace gardens. The episcopal old town is built almost entirely from Languedoc-style red bricks, earning Albi its nickname. 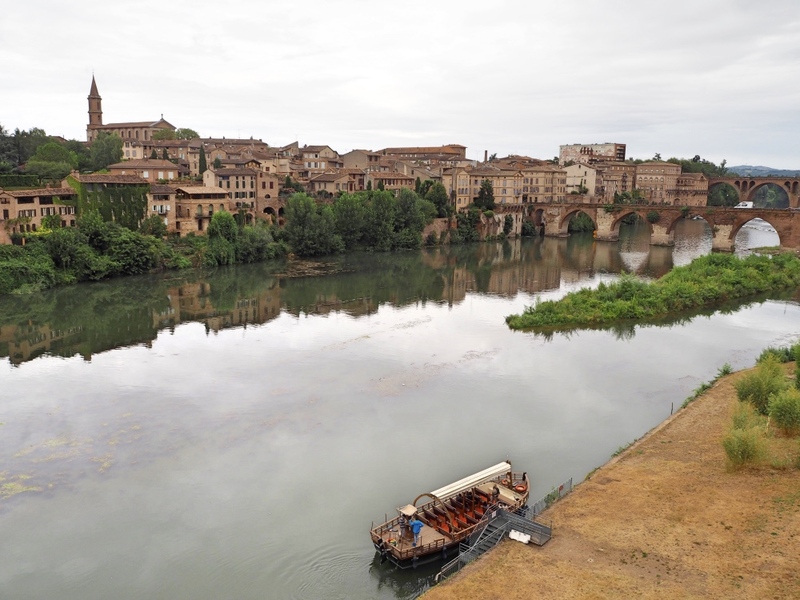 My family had highly recommended visiting Albi, yet once again we knew little about it before we arrived. Sadly the gods were not smiling on us during our visit and the day was cloudy and overcast. So apologies in advance for the gloomy photos. 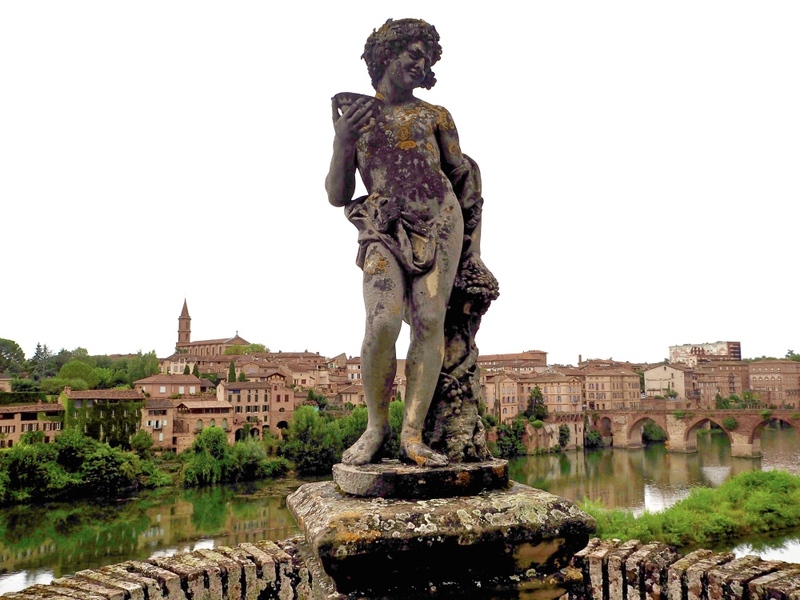 That being said, Albi’s beauty still shines through, even without the sun! 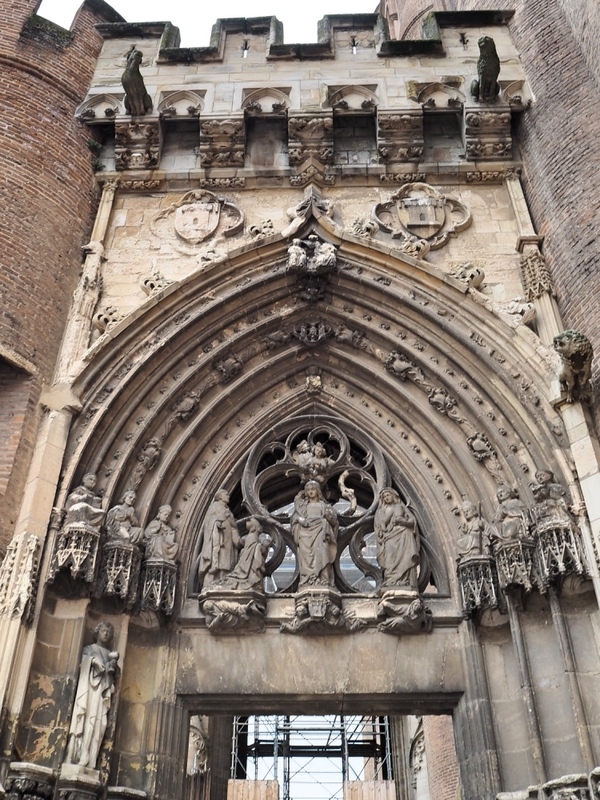 The imposing Sainte-Cecile cathedral was built between the thirteenth and fifteenth centuries and is Albi’s main tourist attraction. It is constructed almost entirely from bricks and is a true architectural wonder. It is considered the largest brick monument in the world and is so large that you can see it from everywhere else in town; so you can’t miss it! The entrance to the cathedral. The cathedral has an amazing and grandiose interior. It’s a real feast of colours with pretty much every wall covered in either frescoes or very detailed stonework. 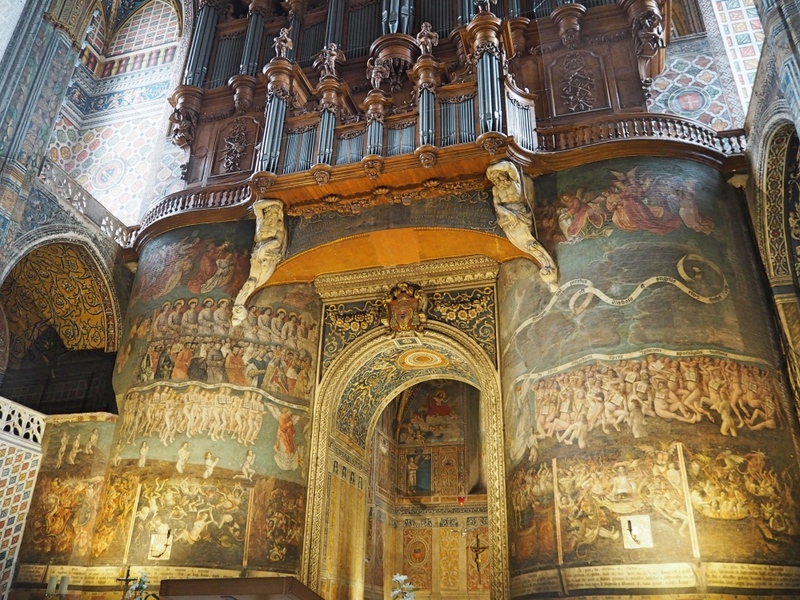 Don’t miss the fresco of the Last Judgment just beneath the organ; it’s incredible. The nave and choir are also really impressive. 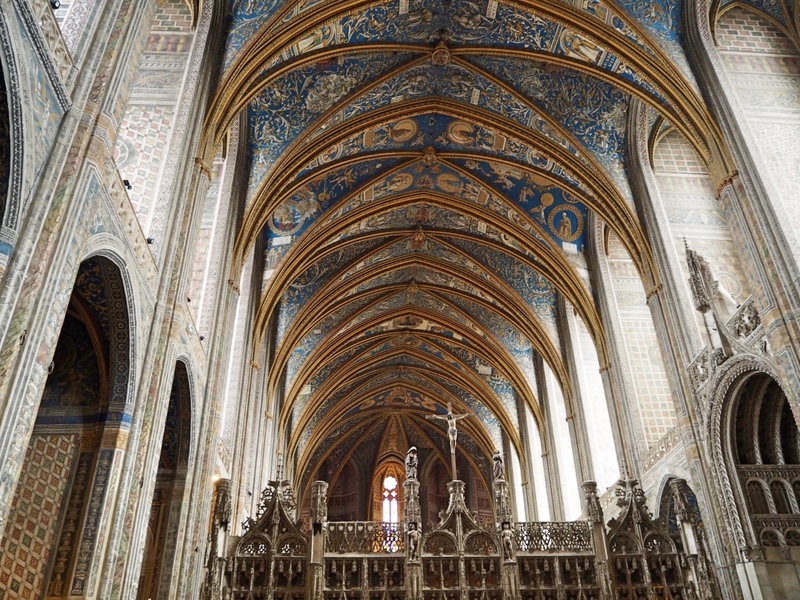 The interior of the cathedral … stunning! Even if you are not religious you should still visit the cathedral. It is one of the nicest cathedrals we have ever seen (and we’ve seen a lot of them!). The cathedral is free to enter, but there is a charge for audio guides and the entry fee to the equally impressive Cloisters and Treasury. The Berbie Palace was built in the 13th century and is found between the cathedral and the Tarn river. 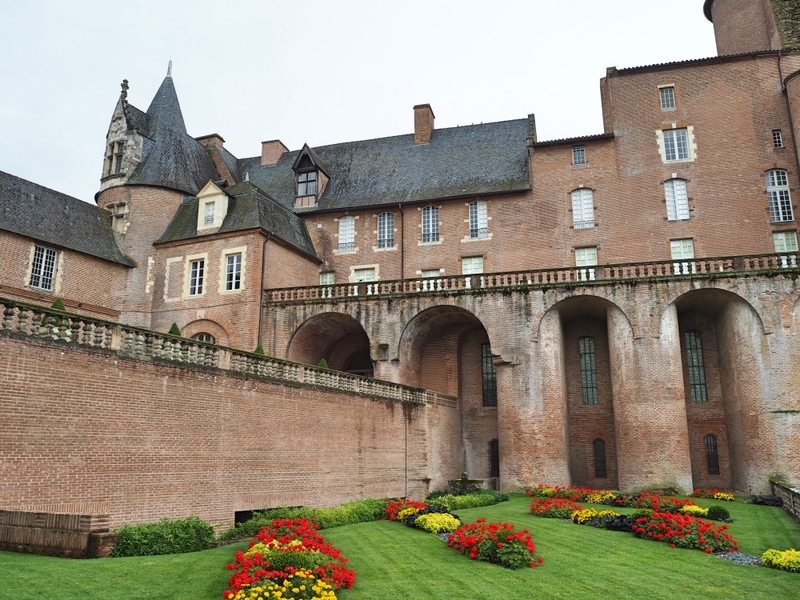 It is one of France’s best preserved episcopal residences and now houses the Toulouse-Lautrec Museum. That museum contains a renowned collection of Toulouse-Lautrec art. If you love art you should make time to visit the museum. Right behind the Berbie Palace are the Berbie gardens which are free to visit. 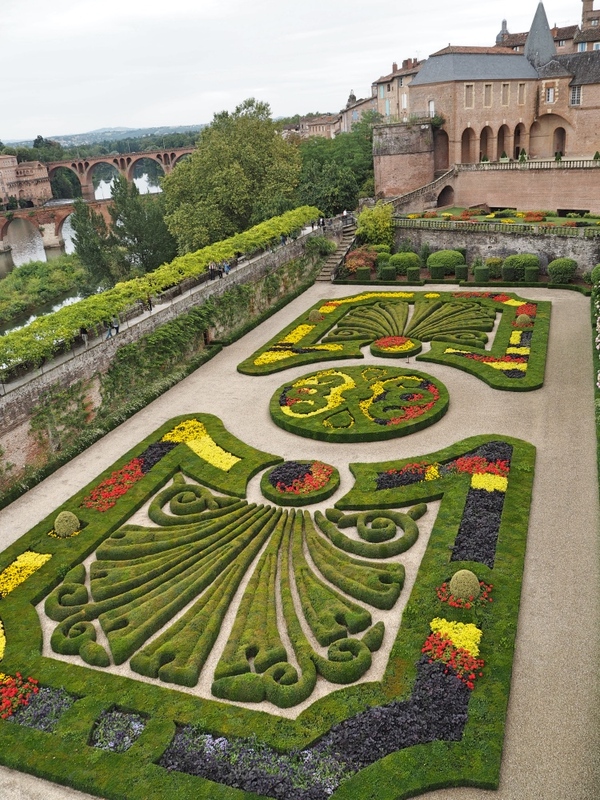 These beautiful and immaculate French gardens have a parapet that overlooks the river. 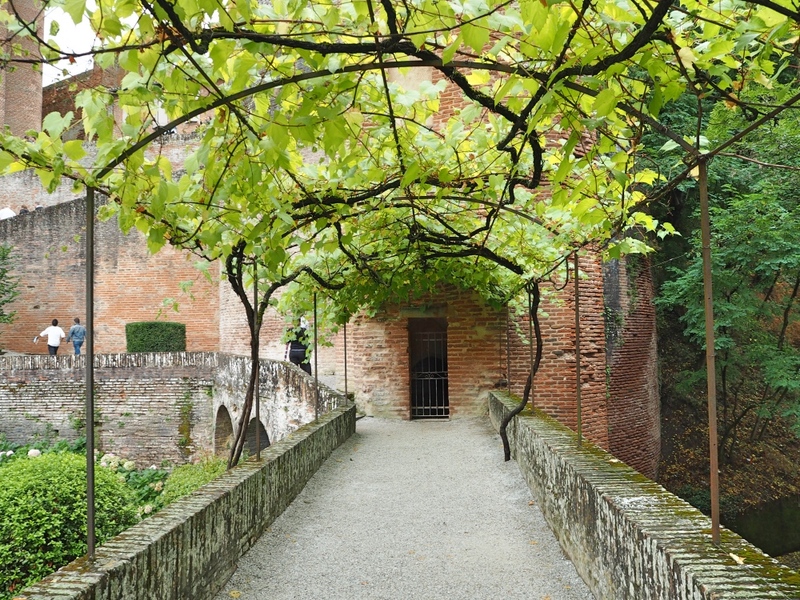 Covered in grape vines, it is lovely to walk along to enjoy the colourful gardens below and some splendid views over the Tarn river and the old bridge. Visiting in summer we were lucky to find the gardens blooming with beautiful flowers which made it even nicer! The beautiful French gardens of the Berbie Palace. A weathered statue in the gardens. The parapet covered in vines. 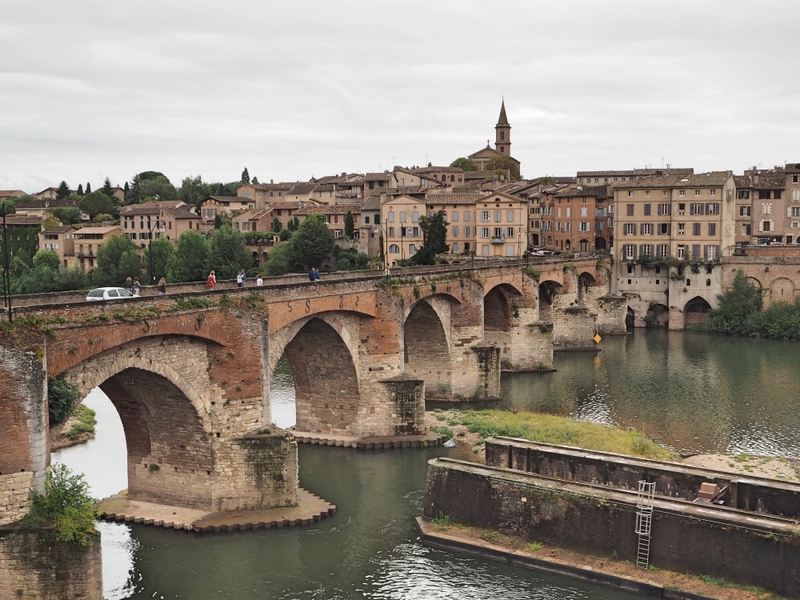 No visit to Albi is complete without walking across its fine old bridge. 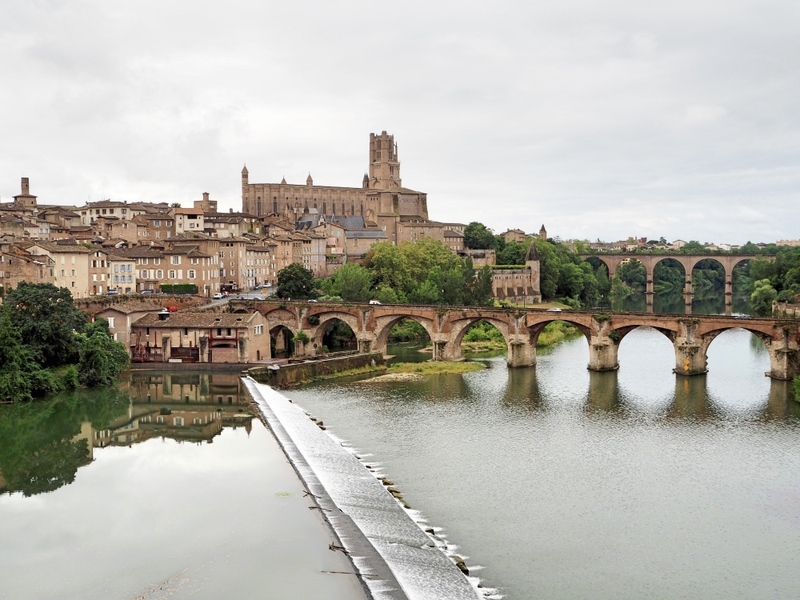 This historic bridge was built in 1035 and offers fantastic views of the cathedral, the city as well as some classic architecture on both sides. It’s a great spot for taking photos. Another great bridge for taking photos is the “Pont du 22 Aout” which is five minutes walk east of the old bridge. From there you will get great shots of the cathedral, the river and the old bridge itself. The view from the Pont du 22 Aout. In the summer time, there are thirty minute long cruises that run along the Tarn river, depending on the weather. Sadly due to the poor weather on the day we visited they were not running. We would have loved to take a cruise! 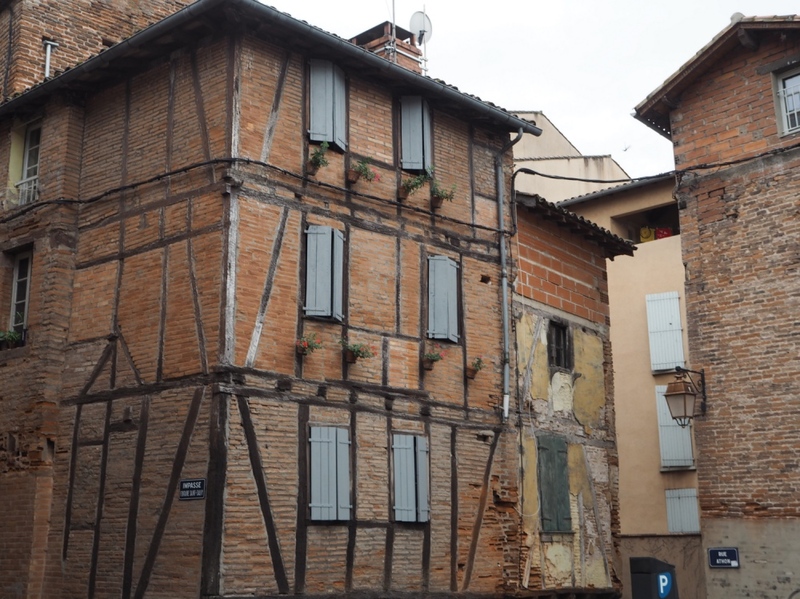 After checking out the cathedral, the river and the palace, we wandered around the streets of Albi’s old town. With its traditional houses and lots of interesting little shops and restaurants, it was nice to walk around and admire the architecture. Thankfully we didn’t let the miserable, rainy weather deter us from exploring this charming little city because we really enjoyed it. Sure it would have been nice to have a beautiful blue sky in all of our photos and to spend more time wandering around Albi’s streets but maybe we’ll be luckier next time! 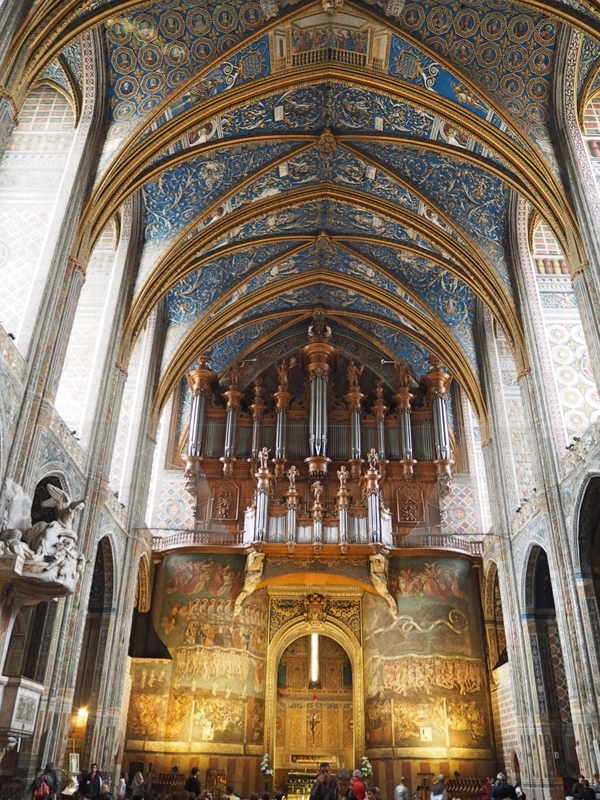 If you are visiting Toulouse, try and allow time for a side trip to check out Albi as it is well worth it. I’d say that the lack of sun made no difference, Albi looks absolutely stunning! Just look at the incredible architecture! Yes it’s a beautiful place. Thanks for your lovely comment. 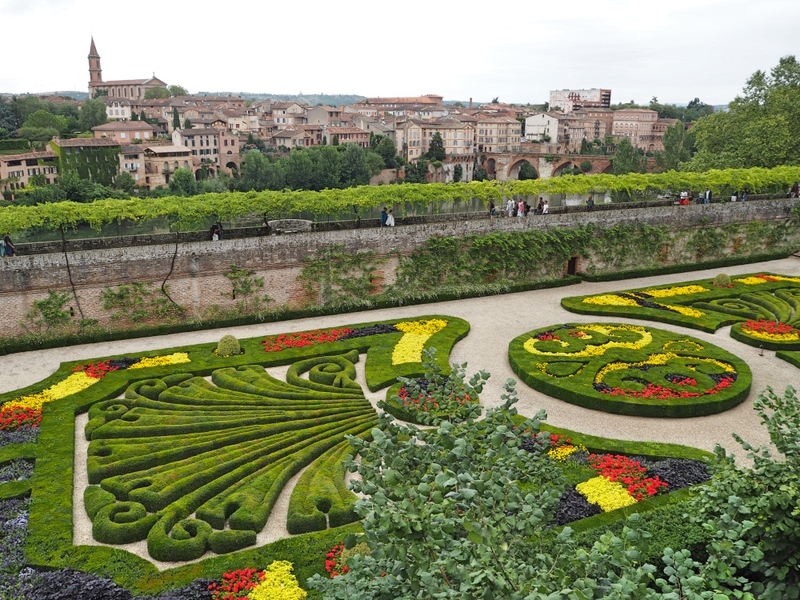 Albi looks like a terrific place to visit – I love your photos of that Cathedral, how magnificent! I’ll keep this in mind for some day when I’m doing a south of France trip. Thank you so much for your comment Rebecca. You should definitely add it to your bucket list! Thank you! Glad you enjoyed the post and definitely add Albi to your bucket list. It’s an interesting place!